Summary: Pickle Gulch is a good moderate challenge. The main ostacle is at the very start of the 4WD road. 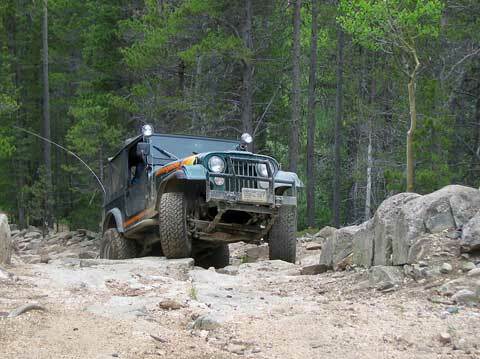 It is a longer hill climb with a large rock outcropping to navigate at the top. At the mid section of Pickle Gulch is another steep climb in the aspen trees before topping out on the flanks of Dakota Hill. Attractions: Rocky hill climb. Mines. Scenery. Best Time: June - The lower section in the trees may still be drifted closed. September - Late in the month, fall colors. Camping: There are a few dispersed sites at the lower end and at the upper end of Pickle Gulch. Be aware of private property in the area. Base Camp: This would be a good area to base camp with the large network of 4WD roads to explore. The US Forest Service run Pickle Gulch group campground would be a good place to base camp to explore the surrounding area. There are also primitive campsites at the top of Pickle Gulch near Dakota Hill and Oregon Hill. Fall Colors: Very Good. The upper section of Pickle Gulch runs through a large aspen grove. There are quite a few meadows and openings for distant views of the hill sides. Navigation: From Black Hawk, CO head northwest on Colorado Hwy 119 for about 3.5 miles. Turn left onto CR 15-S, Missouri Gulch Road. Follow Missouri Gulch road for 0.8 miles. Turn left toward the Pickle Gulch Campground. 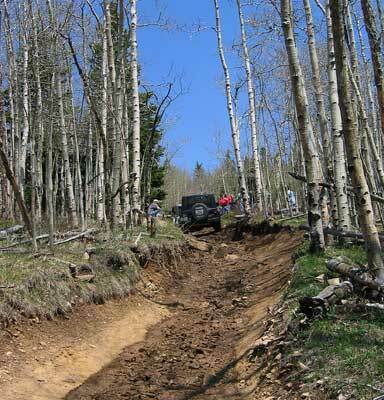 Continue past the campground about a 1/4 mile to the start of Pickle Gulch 4WD road. It will continue west into the trees at a left turn of the graded road just before a locked gate. History: Pickle Gulch may have been an access road for the Old Kentucky Mine. 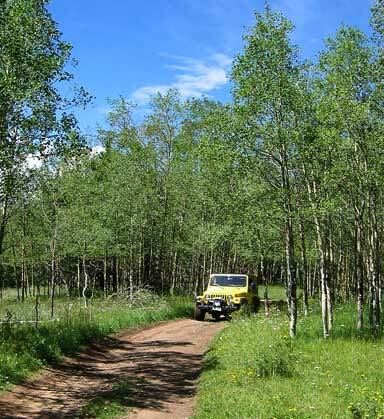 Starting at the southern end of Pickle Gulch, near the Pickle Gulch group campground, is the normal direction to run this 4WD road. The beginning of Pickle Gulch is narrow through the trees. Within a short distance you will come to the main obstacle. It is a steep hill climb strewn with larger rocks. At the top is a large rock outcropping with an off camber notch through it. This is the technical part of Pickle Gulch. There is a bypass that goes around the obstacle. Once on top you continue winding through the trees working uphill until you reach a small meadow. The road continues across the meadow and then climbs another steep section through the aspen trees. 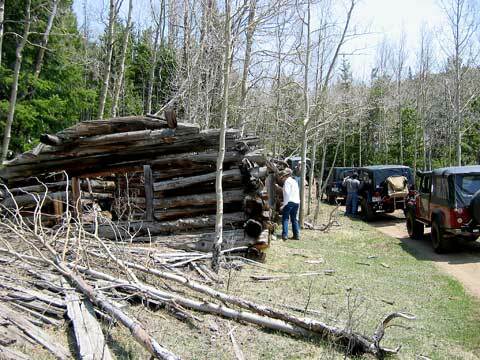 You will go by a few cabins along side the road in a small clearing. Further on are the remains of another cabin on one side of the road and mine tailings of the Old Kentucky mine on the other. Pickle Gulch 4WD road continues on entering a small valley. The road will stay on the west side of the valley part way up the slope. The end of Pickle Gulch is in a broad saddle at the top of the valley with Dakota Hill 4WD road continuing north.